Ahmad Rahami, the naturalized 28-year-old native of Afghanistan hunted in connection with a series of bombings in New York City and New Jersey over the weekend, has been charged with five counts of attempted murder of a law enforcement officer after a gun battle that left two officers wounded, officials said. Rahami was taken into custody earlier Monday after the shootout that left officers Angel Padilla and Peter Hammer injured. Federal charges were still pending, and the U.S. attorneys in New York and New Jersey will likely charge him with terrorism in the coming days, FBI officials said on the scene in Linden Monday evening. They called it a “war zone” and something out of “the movies.” Witnesses describing the dramatic scene as police closed in on suspect Ahmad Rahami in Linden this morning. Sarah Wallace reports. Padilla was shot in the torso during the takedown in Linden, New Jersey, but he was not seriously wounded because he was wearing a bulletproof vest. It wasn't clear where Hammer was hit, but both officers were expected to make full recoveries. Rahami was shot 10 times, including once in the leg, according to FBI officials on the scene, and was taken to a hospital by ambulance. He is expected to survive, and video showed him alert and conscious. Photos from the scene showed the thickly bearded suspect on the rain-soaked sidewalk, his hands cuffed behind his back, his shirt rolled up revealing his bare chest as he lifted his head up off the ground. Officials said he underwent surgery, but did not have additional updates on his condition. 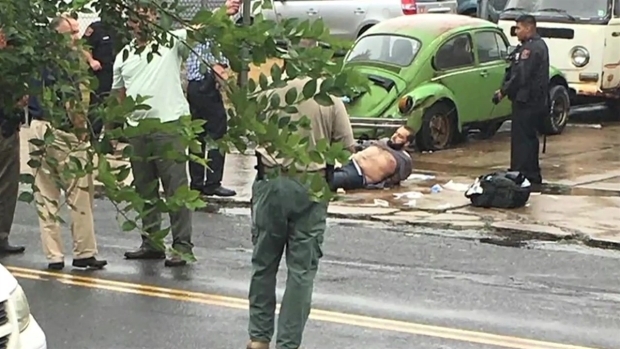 Ahmad Rahami, a 28-year-old naturalized Afghanistan citizen suspected in bombings that rocked New Jersey and New York City over the weekend, was taken into custody after a gun battle with police in Linden, New Jersey, a senior law enforcement official said. In addition to the counts of attempted murder, Rahami is charged with second-degree unlawful possession of a weapon and second-degree possession of a weapon for unlawful purpose, Union County Prosecutor Grace H. Park announced Monday evening. Bail for Rahami in the Linden officer shootings has been set at $5.2 million. It wasn't clear if he'd retained an attorney as of Monday night. Ahmad Rahami, the naturalized 28-year-old native of Afghanistan hunted in connection with a series of bombings in New York City and New Jersey over the weekend, was taken into custody after a gun battle with police that left two officers injured, four law enforcement sources and other officials said. Authorities had been looking for Rahami in connection with bombings that rocked a crowded Manhattan neighborhood and a Jersey shore town over the weekend. 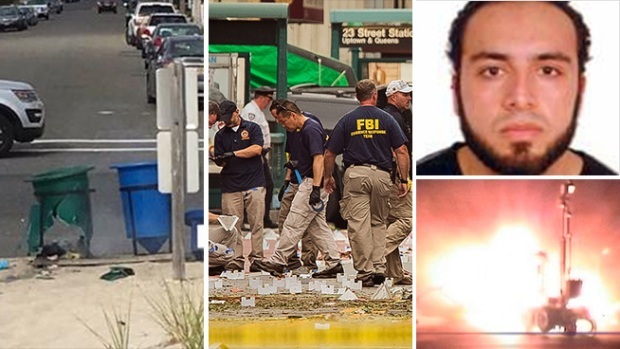 A senior law enforcement official says a fingerprint collected from an unexploded device led investigators to Rahami as a suspect in the bombings at a Marine 5K race in Seaside Park, New Jersey, and the blast in Chelsea. It wasn't clear if the suspect was linked to five pipe bombs — one of which was inadvertently detonated by a robot — found at a train station in Elizabeth, New Jersey, late Sunday, not far from where Rahami was later captured. Grainy surveillance video captures bombing suspect Ahmad Rahami running from police as a gun battle erupted on a street in Linden, New Jersey, Monday. As a manhunt was underway for the suspect, a bar owner called police about a man sleeping in the doorway of his business, police said. When officers arrived, they tried to rouse him and the man lifted his head. They recognized him as the man pictured in an FBI wanted poster released hours earlier and told him to show his hands. Instead, according to police, Rahami pulled out a gun and fired, hitting one of the cops. He then got up and started walking down the street, apparently randomly firing at passing vehicles, authorities said. Eventually, he was taken down. The blast in Chelsea injured 29 people, though all have since been released from the hospital. The explosion left twisted metal and shrapnel scattered across 23rd Street. An unexploded pressure cooker with a cellphone attached and wires protruding was found four blocks away; it was taken to a firing range, where it was safely detonated. The discovery of the Manhattan devices came hours after a pipe bomb exploded in a trash bin at the Marine 5K in Seaside Park. Authorities had said they believed the device had been timed to go off as participants were running by, but the race had been late. It was canceled and no one was hurt. Old-fashioned flip phones were found on the devices in Manhattan and in Seaside Park, law enforcement officials close to the investigation told NBC 4 New York. A senior law enforcement official said information obtained from the phones connected to two unexploded devices also pointed to Rahami. The investigation into the devices found in Elizabeth was ongoing, and authorities were raiding a fried chicken restaurant owned by Rahami's father and several other buildings in the area as part of the probe. 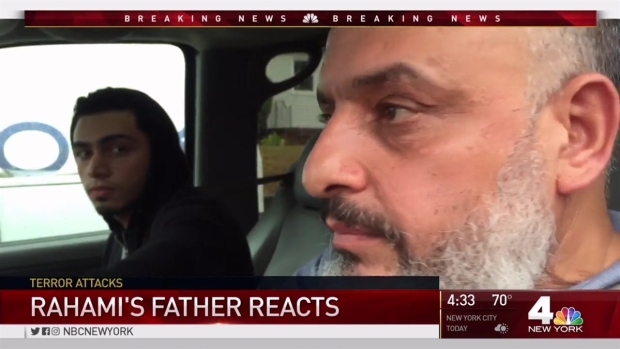 Rahami's father, Mohammed Sr., said little to an NBC News reporter near their home in Elizabeth Monday evening, beyond that he was not aware of any plot his son was engaged in. "I'm not sure what's going on," he said in his car. "It's very hard right now to talk." 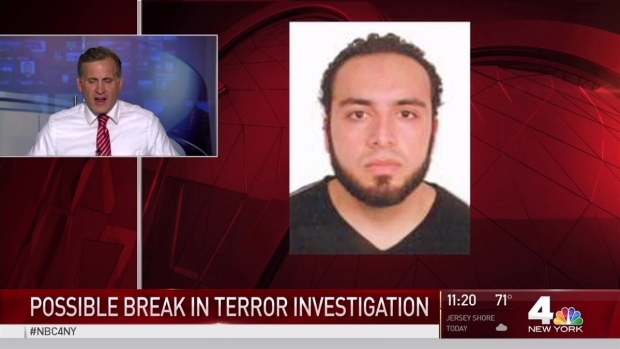 The father of Ahmad Rahami spoke briefly to NBC news after his son was taken into custody. Meanwhile, five people believed to be relatives or associates of Rahami were taken into custody Saturday during a traffic stop on the Verrazano Bridge. 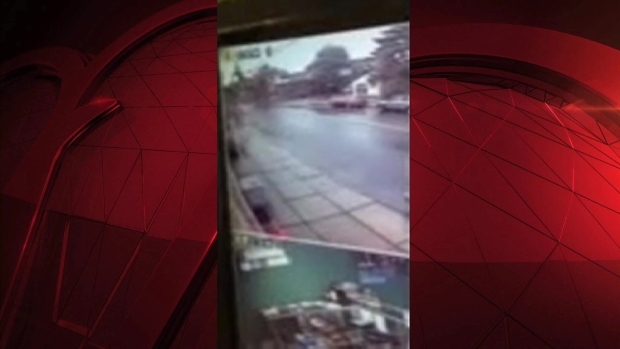 No one was charged; the stop came as authorities pursued a "promising lead" into surveillance video obtained from two sites in Manhattan where explosive devices were found -- one on 23rd Street and one on 27th Street. Rahami is believed to be the man seen on surveillance video at two locations where the explosive devices were recovered. One video shows a man putting an object in a dumpster near 23rd Street and Sixth Avenue, followed by an explosion some time later. Another video from 27th Street shows a man leave a piece of luggage on the sidewalk; that piece of luggage contained a bag with a pressure cooker inside. Investigators are tracking down leads and combing through evidence from the scene of the explosion that injured 29 people in Chelsea Saturday night. Here's the latest as the investigation continued Sunday. Jonathan Dienst, Marc Santia, Erica Byfield and Ida Siegal report. The series of incidents put the entire tri-state area on edge. Calls to police about suspicious packages skyrocketed amid heightened tensions. Police at Rutgers University urged students and faculty to clear an area near a parking garage at the New Brunswick campus as they investigated a report of a suspicious package, which was deemed safe an hour or so later. 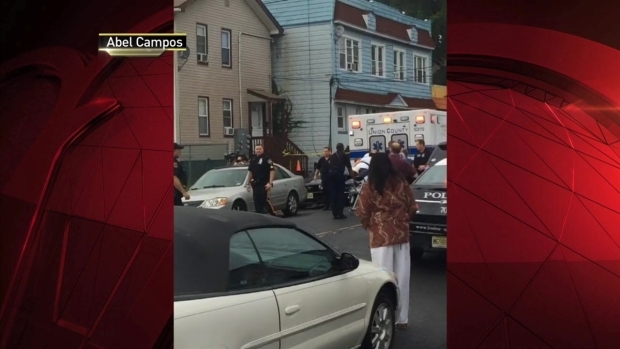 In Paterson, New Jersey, officials also responded to a report of a suspicious item, and social media chatter highlighted a dozen similar emergency responses in New York. The Chelsea explosion left many rattled in a city that had marked the 15th anniversary of the 9/11 attacks only a week earlier and that was schedule to hold a United Nations meeting Monday to address the refugee crisis in Syria. Witnesses described a deafening blast that shattered storefront windows and injured bystanders with shrapnel in the mostly residential neighborhood on the city's west side. It was new NYPD Commissioner Jimmy O'Neill's first full day on the job. 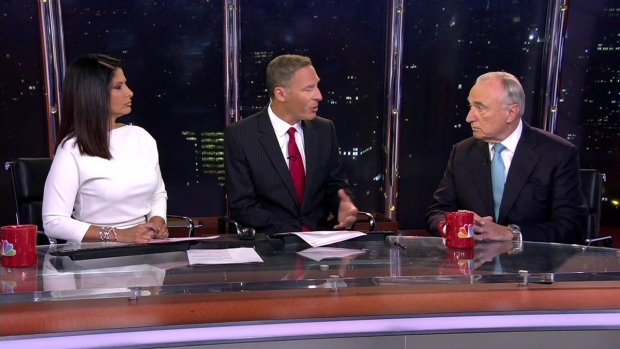 Former NYPD Commissioner Bill Bratton was on Today in New York Monday morning to talk about bombs found in Chelsea and Elizabeth, New Jersey. Former New York Police Commissioner Bill Bratton, who stepped down just last week, said Monday morning this was probably the first successful terrorist attack in the city since 9/11. After hedging on any potential terror angle over the weekend, Mayor de Blasio said at a news briefing Monday that there is "every reason to believe" the bombings in the city and in New Jersey were "an act of terror." Authorities said, though, that there was no indication of a terror cell in the area, and officials said they were not looking for anyone else in connection with the attacks. Two senior officials confirmed to NBC News that Rahami was not on a U.S. terrorist watchlist. One of the sources, a former senior intelligence official with the NYPD, says that the NYPD intelligence bureau does have its own list of individuals called the "persons of interest" list, but that source said "the NYPD did not have this guy on the radar" before Saturday. He also has no arrest record in New York City over the last five years, a source said. At this point, federal officials do not believe there are any other active co-conspirators. On Sunday, Gov. Cuomo deployed nearly 1,000 additional State Police and National Guard troops across the city to guard transit stations and area airports as a precaution. He called for an additional 1,000 troops Monday. The White House said President Obama was briefed throughout the night and early Monday on the investigation into the bombs. At a briefing Monday, the president called the people of New York and New Jersey resilient, and lauded the efforts of counterterrorism officials working on the case. "Folks around here, ya know, they don't get scared," the president said. "They are tough, they are resilient, they go about their business every single day. That's the kind of strength that makes me proud to be an American." Cuomo said Monday he had spoken with the president about the evolving situation, and pledged that whoever was responsible would be brought to justice. "The disruption is going to be to their lives, not our lives," Cuomo said. "We've been through a lot worse."